I have always tended to prefer the company of nerds to the company of the cool. It occurred to me many years ago that nerds have more fun. They are released from the pressure to enjoy only what is currently acceptable to enjoy by whatever cool culture in which they find themselves. Nerds are free to like what they like. In fact, it’s this liking of stuff considered nerdy by the non-nerdy that defines a nerd. These days nerds tend to like Dr. Who and Harry Potter and Japanese cartoons. But wait, you say, I like Harry Potter and I’m not a nerd. This may be true. Nerdiness also has to do with the degree to which you like stuff. Nerds don’t just like Harry Potter. They are bazonkers about Harry Potter. They own Harry Potter stuff. They name their pets Snape, or Doby, or Hagrid. They fantasize about attending Hogwarts. They memorize Latin spells. And so on. 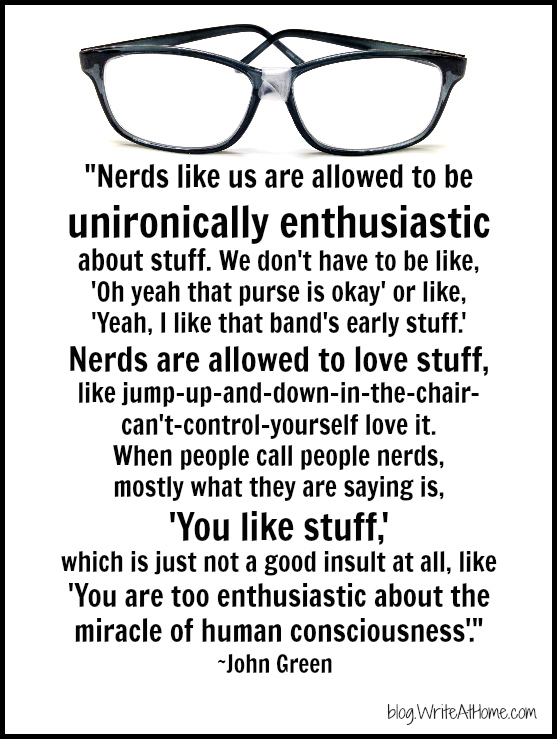 And that’s precisely why I like nerds. They enjoy life more than cool people. … nerds like us are allowed to be unironically enthusiastic about stuff. We don’t have to be like, ‘Oh yeah that purse is okay’ or like, ‘Yeah, I like that band’s early stuff.’ Nerds are allowed to love stuff, like jump-up-and-down-in-the-chair-can’t-control-yourself-love it. Hank, when people call people nerds, mostly what they are saying is, ‘You like stuff’, which is just not a good insult at all, like ‘You are too enthusiastic about the miracle of human consciousness’. This part happens about :50 into the video below. It’s better to watch and listen than to just read it. I agree, with John. Do you? I’d love to hear your perspective. Share your thoughts in the comments section below! Sweet! What are you learning about my geeky passions? At least in my generation, nerdy is the new “cool.” In many circles, if you don’t know everything about video games, anime and fantasy movies, you’re a bit of an outcast. If you’re not gung-ho about every nerdy thing, you often find yourself standing by the punch bowl wondering if there is anyone at this party who talks about real-life stuff like politics and weather… until you meet someone who likes the same Victorian novel as you do. And then life gets better. Me, too. As far back as I can remember I’ve preferred the company of the uncool and nerds. Another thing about nerdy types: you can learn a lot from them. If they are into classical music with an emphasis on Bach cantatas (this is not a made up example), then they are REALLY into it and you can learn a lot about music and history and beauty from their deep appreciation of something God put here for our enjoyment. Quirky and passionate people make life much more interesting. Actually, Robert, that’s exactly why I like hanging out with you! Leave a Reply to Lisa Strader Click here to cancel reply.